TheYamaha YAS-203 ($300, 3.5 stars) is quite the budget alternative in this roundup, but by trimming $100 to $200 off the purchase price, you’ll have to expect to make some sacrifices. You’ll find the first one—a biggie—when you go to plug it in. There are three connectivity options on the back of the YAS-203: a pair of RCA jacks, a digital coaxial input, and digital optical input. If you’re thinking I forgot to mention HDMI—the overwhelming standard for home-theater hookups—then stop holding your breath. There isn’t one, which may immediately and understandably kill the YAS-203 as an option for you. If you mix and match these hookups (say, using RCA with a DVD player), you’ll have to keep it all straight in your head. If you’re trying to use this sound bar with a standard receiver, you might face some trouble. Fortunately for casual listeners, Bluetooth is also included. Once connected, the YAS-203 proves to be a capable speaker given its price level. The 35-inch Yamaha is a curved unit, but not the way you might be expecting. Rather than curving inward to match today’s high-end TVs, it curves outward, a design which helps to bounce sound around the room a bit more. 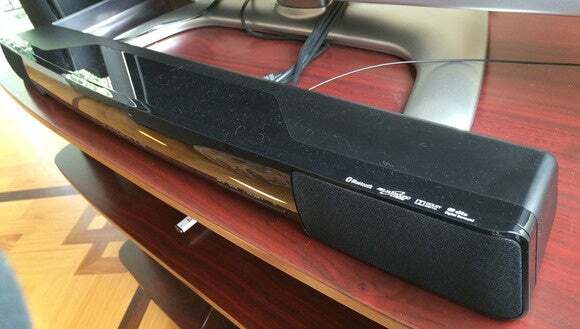 A front-firing, wireless subwoofer is also included. Dolby Digital, Dolby Pro Logic II, and DTS are supported. Lack of support for Dolby TrueHD and DTS-HD Master Audio is understandable, as those codecs require HDMI. While it isn’t in the realm of stellar, overall audio quality is above average, even with low-end connectors. With just 50 watts of power to each the main speakers and another 100 watts to the subwoofer, you won’t be shaking the walls with this 2.1-channel rig. It was loud enough, though, for my large living room, and more importantly didn’t experience any significant distortion as it ramped up. The beefier bass element really helps to fill the room and add dimension to both effects-driven TV and music. The Yamaha remote is a cute throwback to yesteryear, but finding the virtual surround setting (highly recommended) and other items like clear voice mode (less useful) are easy enough. You can even fine-tune things like the audio delay of the speaker and change the subwoofer volume separately through the remote, but it remains a mystery why the master volume buttons—which you’ll use the most—are some of the smallest on the remote. You can also control the system through the Yamaha mobile app, but it’s a bit of overkill for a device like this. Overall this is a fine package considering the price, but in a time where a $20 DVD player includes HDMI, shouldn’t a $300 speaker rig, too? 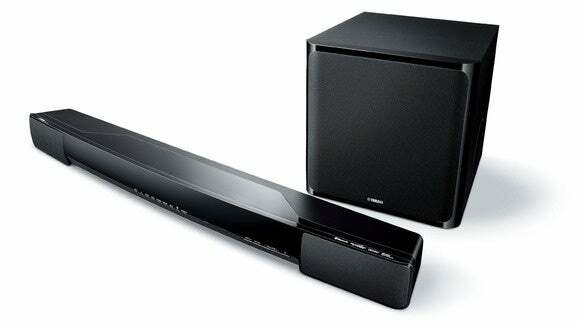 Absence of HDMI support hobbles what is otherwise a great-sounding sound bar.